Through structured conversations, readings, and site explorations residents will articulate different methods for aesthetically “mapping” the historical and contemporary context of Irish relations with global and social systems of power. Residency participants will be invited to develop a proposed project to be presented as both a visual record of research and development through a collaborative exhibition at the gallery at National College of Art & Design, Dublin and a published catalogue documenting the processes of the participants, visiting artists, academics and organisers. The 6-week studio residency will be accompanied by a series of discussions and dinners led by Francis and Kelley as well as many visiting artists, curators, and academics. 4-6 individuals engaged in a variety of aesthetic practices will be selected to participate via open call process. 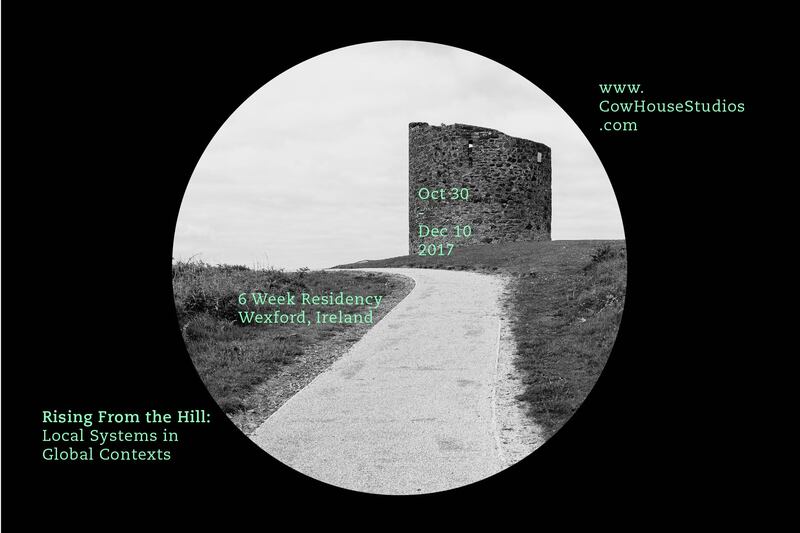 Successful applicants will come to Rathnure and reside at Cow House Studios from October 30th, through December 10th, 2017. Practitioners whose practices have strong conceptual and theoretical grounding are encouraged to apply; visual artists, performance artists, filmmakers, writers, architects, designers, thinkers, etc. During the course of the residency, participants will have time to work independently on their proposed projects, experiment with new processes for exploring, understanding and mapping systems, work collaboratively to produce an exhibition (at NCAD, Dublin Dec. 2017) and subsequently a published outcome to serve as a platform for critical discussion on the interconnectedness of social systems and environments.